More and more users prefer listening to audiobooks instead of reading books nowadays for its larger enjoyment and inconvenience. It takes you only a few hours to finish listening one book while it may take you days if you read it. Yet you can enjoy audiobooks while you are doing exercises, household chores or on a boring fight, road trip. The downside is that audiobooks are generally much more expensive than books. Take Audible for example, if you subscribe to the premium membership $14.95, you will get 1 credit to get 1 Audible audiobook for free. This makes sense for common users. But if you are living on a budget, spending extra fees on digital contents would be a great burden for you. 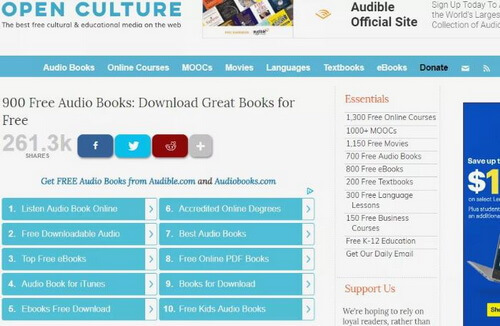 For your convenience, we have picked up the top 8 best websites to get audiobooks free. With them, you will enjoy the same joys audiobooks bring to you without spending any money. 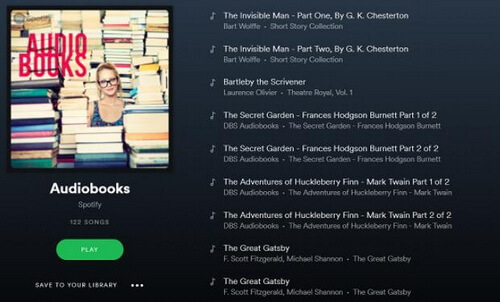 Spotify is originally known as best streaming music platform, but you may not know that it also offers free audiobooks online such as The Secret Garden, The Great Gatsby, Pride and Prejudice. You just need to type in "audiobook" on the search box and press "Enter" to locate the audiobooks from Spotify. 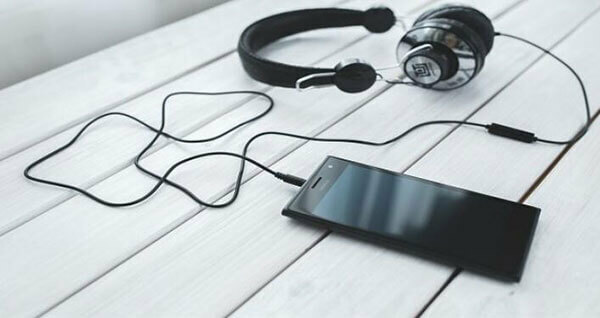 If you have already been a user of Spotify music, then you will find it a breeze to enjoy free audiobooks online from computers, mobile phones. You are not allowed offline listening and there are some random Ads on free account though. LibriVox contains a large library of free audiobooks from public domain narrated by volunteers around the world. It is supposed to be more than 10,000 titles. 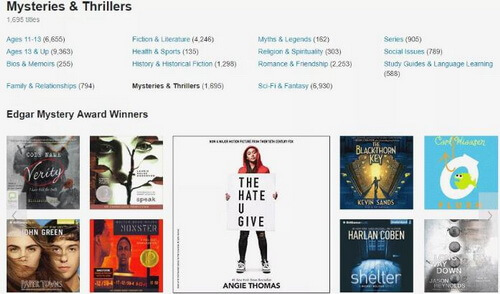 You can search and download a specific audiobook by title, author, genre, language, subject and so on. And you can preview the chapters before downloading. Usually the downloaded files are in ZIP or M4B formats. Enjoying audiobooks on the go with iOS, Android devices won't be a problem. OverDrive is a great audiobook app which cooperates with over 28,000 local libraries to provide the audiobook renting service. If you have a local library card, you can sign up OverDrive to check the available free audiobooks from your local library. There are latest fiction and non-fiction books including the best-sellers. Besides, OverDrive also let you access to eBooks, videos, music. For computers, you can download OverDrive program to start borrowing free audiobooks and other contents. For mobile phones, you can download the Libby, the mobile app for Android, iOS and so on. 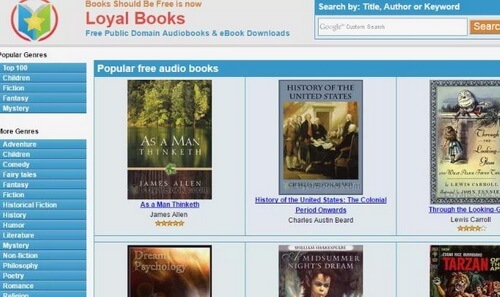 This is another best source for finding free audiobooks. 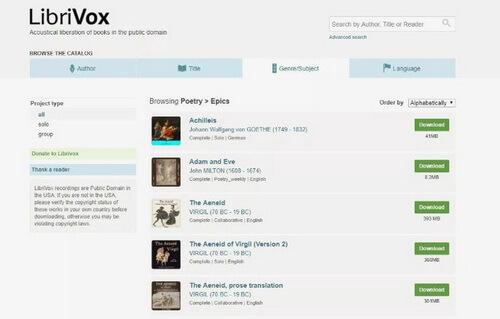 Lit2Go uses a unique technology to organize the audiobooks based on readability using the Flesch-Kincaid Grade Level index. You can easily find the right material for different students even if you are not a teacher. 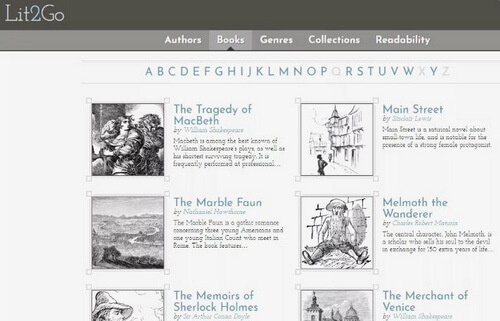 In addition, yo can also browse audiobooks through genres like Fable, Epic, Adventure, Horror and Poetry. If you'd like to read the books during listening, you can also download a copy of the of the book in PDF format. Audible is not a free audiobook subscription service. But it offers a 30-day free trial for all new users. During the trial, you will receive 1 credit to get 1 audiobook you want for free. Besides, even after free trial, you can still get access to a large library of free books. Just input "Free Audiobooks" to search it from Audible website. 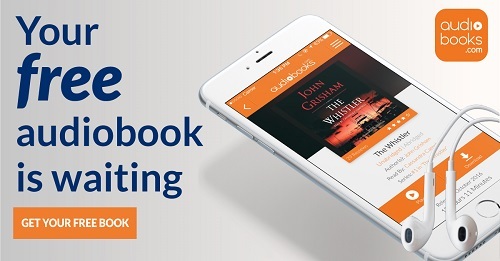 The Audible app is lightweight and super easy to use. You can install it from almost any of your mobile devices including iOS, Android, Windows and so on. Like Audible, Audiobooks charges $14.95 for a premium membership. This is rather expensive for some users. Fortunately, audiobooks.com website also offers a bundle of free titles. You can download the free audiobooks for offline listening on iOS, Android. The downside is that there are lots of Ads in the free version. If you get used to it, then it won't be a problem. You should definitely give it a try if you can't find the book you want elsewhere. If you are looking for classic audiobooks, you should take a look at Open Culture. It doesn't store audiobook files from its server. But it offers the direct link to different sources of free audiobooks. Such as iTunes, Archive, NPR and so on. The website organize the books by genres like "Business", "Computer Science", "History", "Literature", "Physics" etc. You can either stream free audiobooks online or download them for offline listening. Loyal Books is a family-friendly website that meets the requirements of users who enjoy classic literature. You can find a list of public domain novels in different languages. Plus, there are ratings and reviews from fellow listeners. You can check the reviews out before you downloading the audiobooks. And the downloaded files are in MP3, MP4 formats, making it easy to play anywhere. That is all the top 8 best free audiobook services we want to recommended. Besides, there are still a lot of other sources such as Storynory, Hoopla, Internet Archive which enable you to listen to audiobooks for free. But since not all books for free, you can also try this way to enjoy audiobooks at a cheap price. 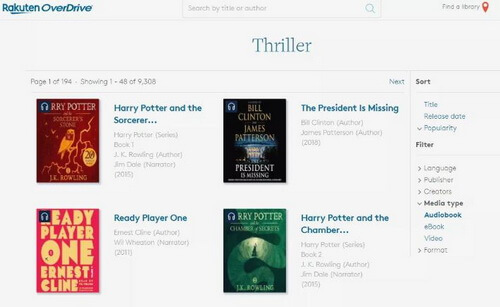 If you are willing to pay a few dollars $8.99/month, you will be able to access to unlimited audiobooks from Scribd. Let's know if you have any suggestions or questions.